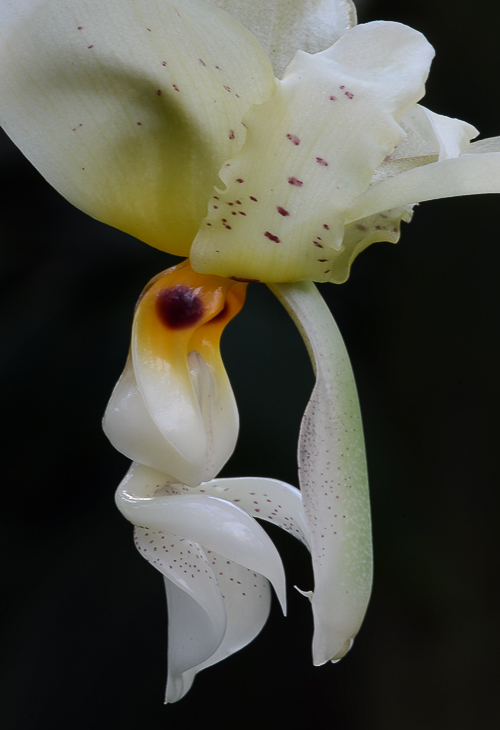 Stanhopea ruckeri flowers in August and September in our greenhouses. It has been fascinating to observe the different color forms and scent variations among our plants. S. ruckeri varies in color from albino to apricot, and may occur with or without eyespots and scattered dots. Some clones have a scent that is almost undetectable. Others have a light floral fragrance. Still others smell like candy Red Hots. 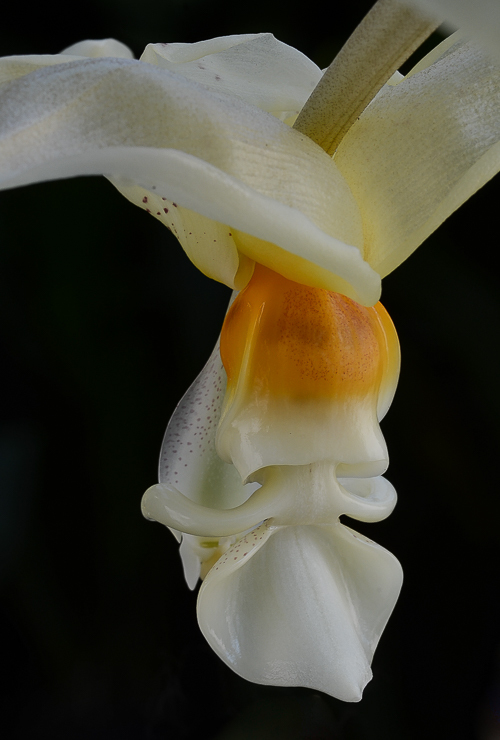 The morphology of their flowers is pretty similar. The biggest obvious difference is their scent chemistry. The first two pictures show ABG# 1990-1503, a clone with lots of spots on the petals and sepals and two barely visible eyespots on the dorsal side of the hypochile. It has a light rosy floral fragrance whose main component is phenyl-ethylalcohol. On the underside of # 1990-1503's lip are two more faint eyespots. Another plant, # 1997-0230, has two bold eyespots. This clone smells like cinnamon (it's a mixture of trans-cinnamaldehyde, cinnamyl-alcohol and cinnamyl-acetate) and benzylaldehyde. This plant also has a second pair of pale eyespots on the underside of the lip. The extra sprinkling of tiny spots on the underside of the column were a surprise. The spots and the fragrances remind me that pollinators experience a sensory world very different from ours. 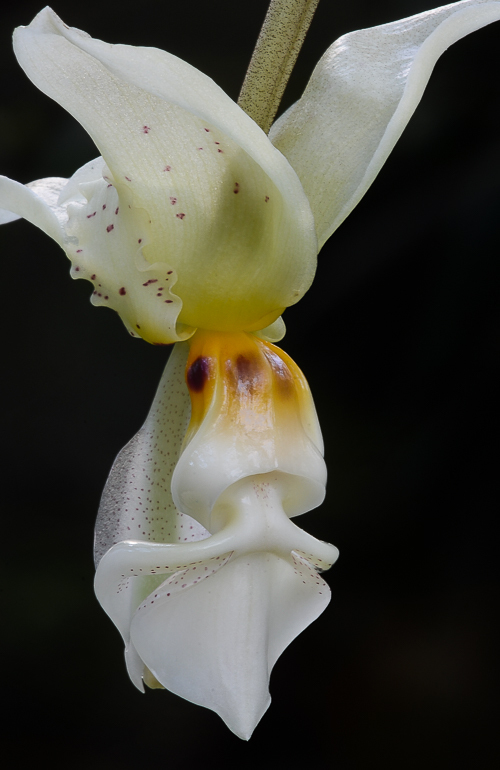 Stanhopea ruckeri, with its different chemotypes, is a puzzling entity. Calaway Dodson suggested that S. ruckeri may be a group of natural hybrids between S. wardii and S. oculata, but more research is needed. We grow our plants in a mixture of long-fibered premium sphagnum and coarse chopped tree fern fiber. 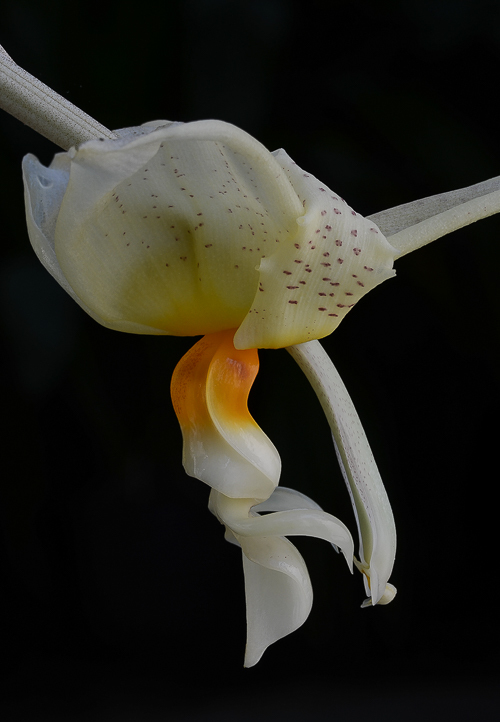 Stanhopea ruckeri is easy to grow in an intermediate (58º night minimum) temperature greenhouse and 60% shade. It grows quickly, produces multiple spikes and makes a handsome overwhelmingly fragrant specimen basket.